Oprah Winfrey speaks onstage at Q85: A Musical Celebration for Quincy Jones on September 25, 2018 in Los Angeles, California. There was a time when 65 was considered retirement age, but of the many sexagenarians shifting that paradigm, leading the charge has to be the indomitable, innovative, inspirational force that we know as Oprah Winfrey. Winfrey is 65 years young today, and shows no signs of slowing down, as her media empire continues to grow and flourish—it’d be a billion dollar understatement to say she’s come a long way from being born into abject poverty in 1954 Kosciusko, Mississippi. Along the way, Winfrey has broken barriers, changed lives and won hearts, proving to the world just how powerful black girl magic truly is, long before the catchphrase (in fact, she’s accomplished so much, we can’t even begin to list it all here). And at 65, she’s still showing us just how far a black woman’s brilliance can take her, while taking legions of others along for the ride. And O, what a beautiful ride it’s been, so far. In honor of Winfrey’s latest milestone, we’ve compiled 65 of our favorite Oprah moments—and look forward to many, many more. Oprah Winfrey wins Miss Black Tennessee, 1971. Oprah Winfrey speaks at a podium early in her career, during her time at WJZ, Baltimore, Maryland, January 20, 1978. A portrait of Oprah Winfrey upon becoming co anchor of Eyewitness News on WJZ, with co host Jerry Turner, Baltimore, Maryland, June 26, 1978. Oprah Winfrey hosting ‘AM Chicago’ in 1984. Oprah appears as Sophia in the 1984 film adaptation of The Color Purple, for which she is nominated for an Oscar. Oprah Winfrey at the 58th Annual Academy Awards Nominees Luncheon, January 1985. Oprah brings 67 lbs. of fat onto the Oprah show set to represent her weight loss, 1988. American actress Oprah Winfrey as Mattie Michael in the television miniseries, The Women of Brewster Place (directed by Donna Deitch), 1989. Oprah Winfrey during 1995 Academy Awards in Los Angeles, California, United States. Oprah Winfrey reacts to a blowup of her picture on the cover of Vogue’s October issue at party at Balthazar. Oprah Winfrey during O, The Oprah Magazine Launch Party at The Metropolitan Pavilion in New York, New York, United States, April 2000. Oprah Winfrey arrives with dog Sophie at the Shrine Auditorium in Los Angeles, Ca. on June 29, 2000 to speak about personal growth and empowerment. Oprah Winfrey poses April 17, 2001 at a 1st anniversary party for O Magazine in New York. Oprah Winfrey speaks during a commencement for The Young Women’’s Leadership School June 26, 2001 at New York’’s Metropolitan Museum of Modern Art. Oprah Winfrey arrives at the annual Kennedy Center Honors Gala on December 2, 2001 at the Kennedy Center in Washington, DC. Oprah Winfrey poses backstage with her ‘Bob Hope Humanitarian Award’ during the 54th Annual Primetime Emmy Awards at the Shrine Auditorium on September 22, 2002 in Los Angeles, California. Oprah Winfrey (l) and Gayle King, front row at Vera Wang’s Spring Collection, 2003. Oprah Winfrey makes remarks after she is named the recipient of the 2003 Philadelphia Marian Anderson Award November 18, 2003 in Philadelphia, Pennsylvania. The Philadelphia Marian Anderson Award is given each year to an artist that uses their humanitarian efforts to inspire the world. Talk show host Oprah Winfrey attends the 30th Annual People’s Choice Awards at the Pasadena Civic Auditorium January 11, 2004 in Pasadena, California. Oprah Winfrey attends the 76th Annual Academy Awards at the Kodak Theater on February 29, 2004 in Hollywood, California. Oprah Winfrey and Sesame Street Muppet Elmo attend the Sesame Workshop’s Second Annual Benefit Gala June 2, 2004 in New York City. Oprah Winfrey makes a surprise appearance on this evening’s Tonight Show to celebrate the show’s 50th anniversary. Oprah Winfrey presents an award at the 5th Annual Directors Guild Of America Honors at the Waldorf Astoria Hotel September 29, 2004 in New York City. Oprah Winfrey speaks on stage at the 16th Carousel of Hope presented by Mercedes-Benz benefiting the Barbara Davis Center for Childhood Diabetes at the Beverly Hilton Hotel October 23, 2004 in Beverly Hills, California. Oprah Winfrey arrives at the 77th Annual Academy Awards at the Kodak Theater on February 27, 2005 in Hollywood, California. Producer Oprah Winfrey arrives at the premiere of ‘Their Eyes Were Watching God’ at the El Capitan Entertainment Center on March 2, 2005 in Hollywood, California. Oprah Winfrey stops and talks to the media while fans gather behind her during her ‘Live Your Best Life Tour’ at the Colorado Convention Center on April 30, 2005 in Denver, Colorado. Host Oprah Winfrey attends the Legends Ball at the Bacara Resort and Spa on May 14, 2005 in Santa Barbara, California. Oprah Winfrey attends the Broadway opening of ‘The Color Purple’ at the Broadway Theatre December 1, 2005 in New York City. Oprah Winfrey attends the 60th Annual Tony Awards at Radio City Music Hall June 11, 2006 in New York City, New York. Oprah Winfrey attends the 25th Anniversary of the Annual CFDA Fashion Awards held at the New York Public Library on June 4, 2007 in New York City. Oprah Winfrey speaks at a campaign rally for Democratic presidential hopeful Sen. Barack Obama (D-IL) at the US Cellular Center December 8, 2007 in Cedar Rapids, Iowa. Oprah Winfrey arrives to the 17th Annual Women In Entertainment Power 100 Breakfast on December 5, 2008 at the Beverly Hills Hotel in Los Angeles, California. Oprah Winfrey reacts to receiving her honorary doctor of humane letters degree before her commencement speech at Duke University on May 10, 2009 in Durham, North Carolina. Oprah is godmother to William Bumpus, 2009 Duke graduate and son of Oprah’s best friend Gayle King. 2010 Kennedy Center honoree Oprah Winfrey speaks to some friends after posing for the formal class photo following the formal Artist’s Dinner at the United States Department of State in Washington, D.C. on December 4, 2010. Oprah Winfrey arrives at The Royal Botanic Gardens for a garden party on December 11, 2010 in Sydney, Australia with 302 audience members from the US, Canada and Jamaica. Oprah Winfrey speaks during the OWN: Oprah Winfrey Network portion of the 2011 Winter TCA press tour held at the Langham Hotel on January 6, 2011 in Pasadena, California. Oprah attends Surprise Oprah! A Farewell Spectacular at the United Center on May 17, 2011 in Chicago, Illinois. Oprah Winfrey attends the Spelman College Commencement at Georgia International Convention Center on May 20, 2012 in College Park, Georgia. 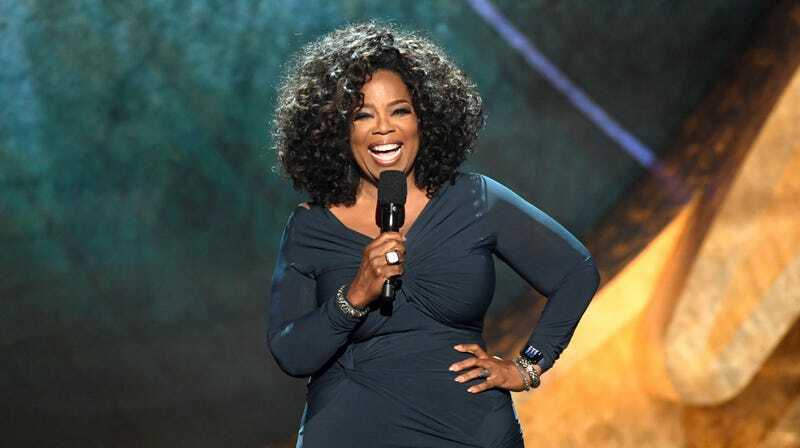 Oprah Winfrey attends LEE DANIELS’ THE BUTLER Los Angeles premiere, hosted by TWC, Budweiser and FIJI Water, Purity Vodka and Stack Wines, held at Regal Cinemas L.A. Live on August 12, 2013 in Los Angeles, California. Oprah Winfrey reacts as U.S. President Barack Obama introduces her during a presentation ceremony for the Presidential Medal of Freedom in the East Room at the White House on November 20, 2013 in Washington, DC. Oprah Winfrey attends the 20th Annual Screen Actors Guild Awards at The Shrine Auditorium on January 18, 2014 in Los Angeles, California. Oprah Winfrey attends the ‘Selma’ and The Legends Who Paved The Way Gala at Bacara Resort on December 6, 2014 in Goleta, California. Oprah Winfrey (L) and Stedman Graham attend the 87th Annual Academy Awards at Hollywood & Highland Center on February 22, 2015 in Hollywood, California. Oprah Winfrey attends ‘The Immortal Life of Henrietta Lacks’ premiere at SVA Theater on April 18, 2017 in New York City. Author Oprah Winfrey attends Oprah Winfrey’s Gospel Brunch celebrating her new book ‘Wisdom of Sundays’ on October 15, 2017 in Montecito, California. Oprah Winfrey accepts the 2018 Cecil B. DeMille Award speaks onstage during the 75th Annual Golden Globe Awards at The Beverly Hilton Hotel on January 7, 2018 in Beverly Hills, California. Oprah Winfrey attends the premiere of Disney’s ‘A Wrinkle In Time’ at the El Capitan Theatre on February 26, 2018 in Los Angeles, California. Oprah Winfrey arrives at St George’s Chapel at Windsor Castle before the wedding of Prince Harry to Meghan Markle on May 19, 2018 in Windsor, England. Oprah Winfrey speaks onstage during the 2018 CFDA Fashion Awards at Brooklyn Museum on June 4, 2018 in New York City. Oprah Winfrey talks to an audience about the importance of voting and her support of Georgia Democratic Gubernatorial candidate Stacey Abrams during a town hall style event at the Cobb Civic Center on November 1, 2018 in Marietta, Georgia.